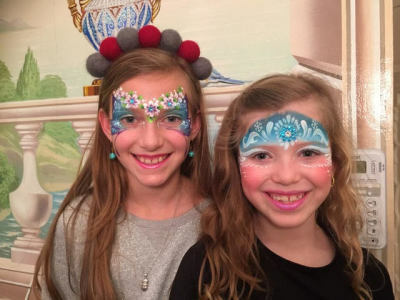 Pnina face painted at our recent party. She was the highlight of the event and each child clamored for the next spot in the chair. From super heroes to princesses to Maccabees, Pnina expertly transformed each child to the character of their dreams. As one little boy aptly stated: "It's not a party without Pnina! I just want to thank you for all the wonderful work you have done for The Friendship Circle over the past few years. It started out we used Pnina for our Purim Party once a year now whenever we have an event or a party there is no Party without Pnina from our Purim Carnival to our past Chanukah Party, B-day Party, Bar Mitzvah Party.Thank you Pnina you’re a pleasure to deal with and you are truly talented. I also hired her this past year for my daughter’s 3rd b-day Party what a hit it was! We all love you at The Friendship Circle. 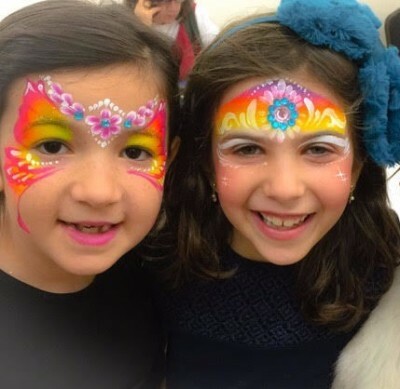 Pnina made my daughter's Bas Mitzvah party a sensation! Her talent and charming rapport kept the partygoers enthralled...and they're still talking about it. If I had realized how much fun she was, I wouldn't have bothered with any other entertainment. Thank you, Pnina, for a Bas Mitzvah party my daughter will never forget! Just wanted to compliment you on a terrific job at our Annual office Chanuka Party. 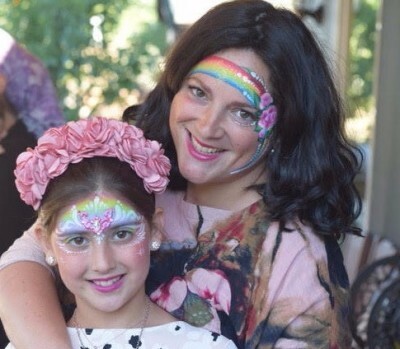 The children really look forward to the party especially the face painting part. One employee told me that her children wanted to leave it on so they can show their friends in school the next day. You're artistic and creative work is beautiful. It's a pleasure working with you and the best part is that the children are happy! Consider yourself booked for next year. 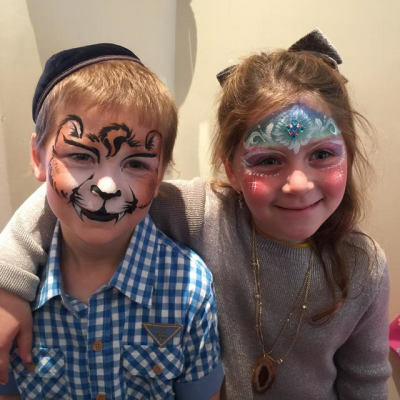 When planning this years’ Chanukah Party we were looking for something popular and fun. 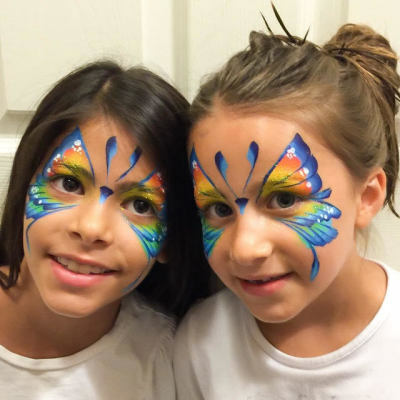 We asked around and we were told that face paint was really trendy these days. 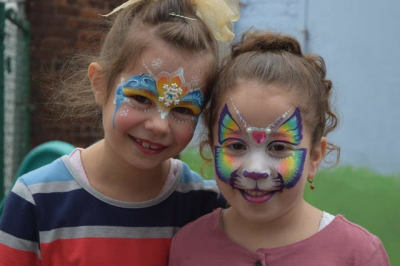 We heard that you did face paint so we asked you to come. From the time that the kids came in the door until the program ended 3 1/2 hours later you produced one overjoyed spiderman/clown/butterfly/etc, after another. 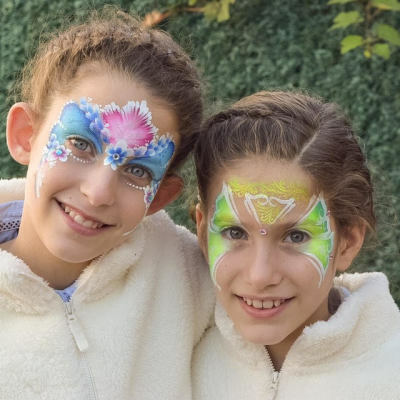 The kids were professionally painted and they were delighted with their new looks. 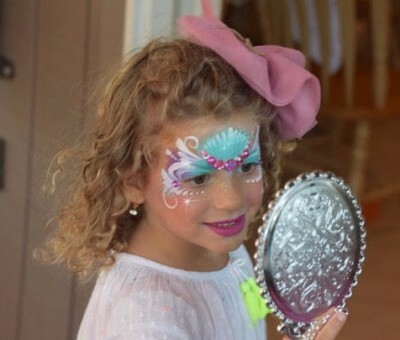 I think that your face painting is going to be a big hit. Thank you once again for a fantastic job. 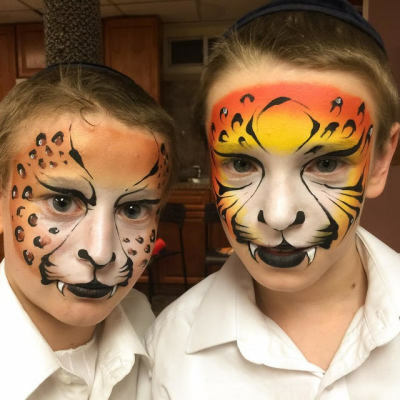 "Pnina brought our annual Purim Carnival to a new level with her amazing face art! There was always a long line to see Pnina." Dear Pnina, Adina was super amazing! She was great!!! The kids loved her and her art work. The guests couldn't stop complementing us about the girls and the entire party. I've always been hesitant to use the Internet and vendors I don't know. I was proved wrong because I see the type of professionals I can come across in my search. Thank you so much for contributing to the success of our Jewish Children’s Museum VIP Chanukah Party! With our many friends and supporters showing up with their families, we needed to be able to offer the children something unique to keep them entertained and happy. You were the perfect answer! With enthusiasm and patience, you beautifully painted the faces of the many children that flocked to your stand. You were friendly, professional, and talented! The children were excited to show their new interesting faces to their friends, and the parents were happy that their kids were having a good time! 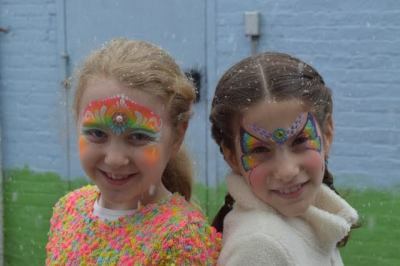 Thanks to you, our packed party had plenty of beautiful decorations - the painted faces of smiling children!